CMMi – Introduction to Development 1.3 : This is where we discussed about introduction to CMMi! Let’s move ahead and learn a bit more about Maturity and its associated parlance in real life. 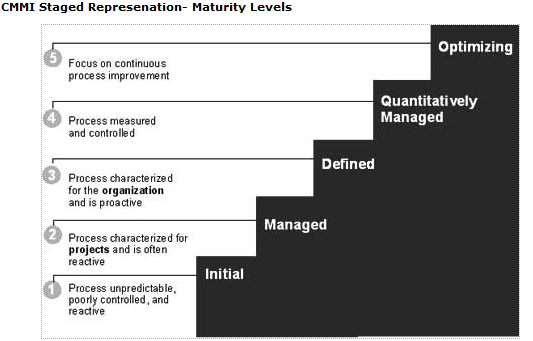 Maturity levels consist of a predefined set of process areas. The maturity levels are measured by the achievement of the specific and generic goals that apply to each predefined set of process areas. The following sections describe the characteristics of each maturity level in detail. At ML (Maturity Level) 1, processes are ad hoc and chaotic. There is no stable environment in the Organization. Success in these organizations depends on the competence and heroics of the people in the organization (Remember I mentioning about depending on Heroes) and not on the use of proven processes. ML 1 organizations will be able to execute the work; however, they frequently exceed the budget and schedule of their projects. ML 1 organizations are characterized by a tendency to over commit, abandon the processes in the time of crisis, and not be able to repeat their past successes. This is very crucial, not able to repeat the success of the past. Does this remind you something? Did I hear some one say Uhh….kinda happened to me and my project? Believe me you’re not alone! At ML 2, an organization has achieved all the specific and generic goals of the maturity level 2 process areas. This is highly significant, as this is the building block for all your further activities. Doing Generic Goals and Specific ones, make it easier for you to have a kick start to ML3. The projects of the organization have ensured that requirements are managed and that processes are planned, performed, measured, and controlled. At this level you have requirements, processes, work products, and services all managed. The entire status of the work related products (Like Requirement docs, Project Plan, Estimation etc.) along with the delivery of services are visible to management at defined points. All te stakeholders are kept involved, they know about where we are…what is left and so on…. At ML 3, an organization has achieved all the specific and generic goals of the process areas assigned to maturity levels 2 and 3. There is a massive learning curve from processes perspective here at level 3. A critical distinction between maturity level 2 and maturity level 3 is the scope of standards, process descriptions, and procedures. At ML 2, the standards, process descriptions, and procedures differ from project to project, there is NO Organization level standard among the processes being followed. We do this and are good, and you do another one, and you also survive, but there is no STANDARD Org level process form which we can tailor all our prject level processes. At maturity level 3, the standards, process descriptions, and procedures for a project are tailored from the organization’s set of standard processes to suit a particular project or organizational unit. The processes that are performed across the organization are consistent except for the differences allowed by the tailoring guidelines. Another critical distinction is that at maturity level 3, processes are managed more proactively using an understanding of the interrelationships of the process activities and detailed measures of the process. Since we are targeting the CMMi V1.3, and hence I am not going in the details of ML4 and ML5.